I thought I had a winner with this CAD/JPY trade, but I guess I thought wrong! The trend line that I drew up didn’t get the respect I thought it would, and the market ended up violating it several times. For a while, sellers were actually in control of CAD/JPY as the pair found its way below 82.00 at the start of the week. But with help from speculation on more QE from the Bank of Japan, CAD/JPY buyers were able to take over. Even the worse-than-expected Canadian retail sales report did little to counteract the market’s bullishness! It’s a pity I couldn’t grab a win with this trade, but on a positive note, it didn’t do me much harm either. Though in retrospect, I do regret not moving my stop to break even when I was up by as much as 85 pips! Drats! Thanks reading my blog! I’ll have another trade idea up soon, I promise! It’s been a while since I last traded this pair, but take one look at this setup and you’ll see why I couldn’t pass this opportunity up! After finding support at 80.25, CAD/JPY has been on a wild sprint up the charts on the strength of hawkish comments from the Bank of Canada. Still, I believe those sentiments have been priced in already and that it’s time for this pair to reverse course. The overall trend of yen pairs the past couple of months has been down, as the yen has gained strength thanks to growing concerns about the global economy and the euro zone’s debt problems. As it is, the pair is testing a falling trend line and Stochastic is now in overbought territory. This indicates that the recent buying pressure may be coming to an end and it’s time for sellers to reassert themselves. I also think we could see some risk aversion take place today, as we’ve got Spanish bond auction coming out soon. Spain has been in the limelight recently and if today’s auction disappoints, it could trigger widespread selling across financial markets. Shorted CAD/JPY at market (82.07), stop loss at 82.82, take profit at 80.25. I think that a 75-pip stop will suffice, because if price does reach my stop loss, it will invalidate the falling trend line that I drew up. I’m currently aiming for former support at 80.25, as it has been a formidable support level. Lastly, I’m only risking 0.50% of my account on this trade, as I recognize that I haven’t traded this pair in awhile and there is potential for some wild moves today. Looking ahead, I’m also concerned with the Canadian CPI report coming out tomorrow. If the index indicates that inflation is much stronger than anticipated, it may give more incentive for the BOC to implement tighter monetary policies. That said, I may choose to close my trade before the release just to avoid event risk. What do you fellas think? 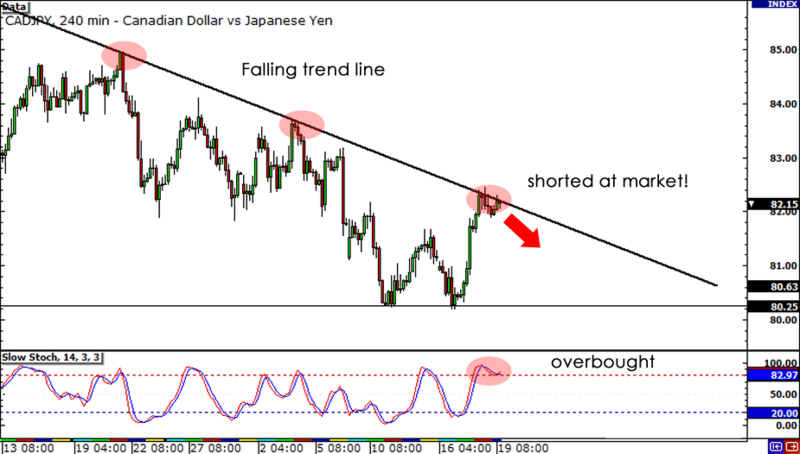 Do you think the trend line will hold on CAD/JPY? 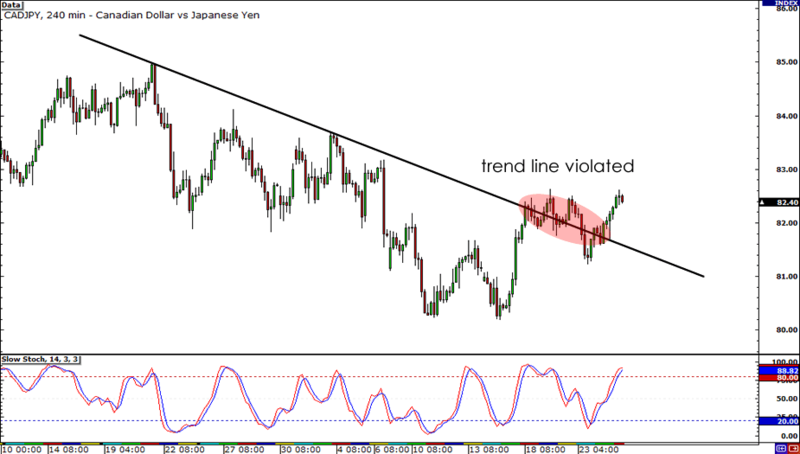 Will the trend line on CAD/JPY hold?